TUBING: Tube 1/4" & 3/8" O.D. Polyethylene, Polypropylene, Nylon, Polyvinyl Chloride, Polyallomer. 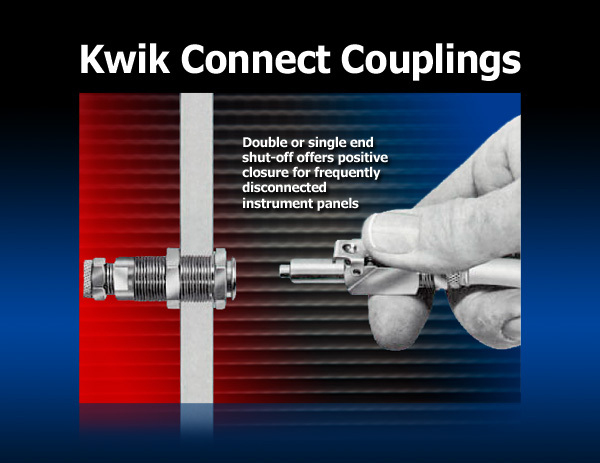 Kwik-Connect couplings witn Poly-Type ends provide positiveflow shut-off when coupling is disconnected...without extra valving. Available in both single and double end shut-ott. PERMITTING FLOW IN EITHER DIRECTION. Kwik-Connect couplings are readily available in tube to tube and tube to pipe thread styles with either double or single end shut-off. A two piece coupler with Poly-Type tube ends. 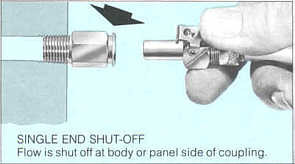 Available in single and double end shut-off. 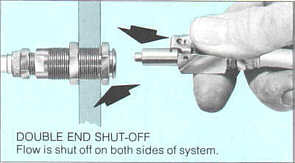 Determine type of shut-off required (single or double end). Select end connection. Specify catalog number for configuration and size desired. Images and Content Copyright © 2008 GlenHill, Inc. All rights reserved. For more information please call 847-690-9810.